A sneakily hidden feature in today’s Snapchat update offers a “trophy case” for achievements you’ve unlocked using the app. 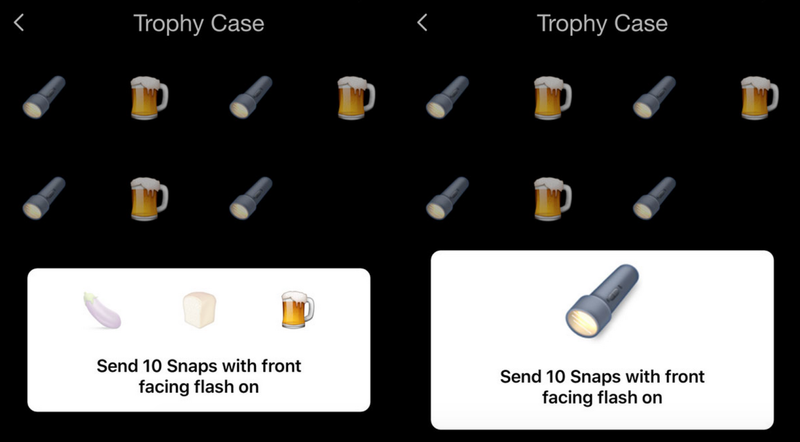 The trophy case contains various things you’ve done in the app to earn trophies, such as taking 10 photos with the front-facing flash on, represented by emoji. We’re guessing that over time, new emoji will show here as you unlock different trophies for doing random things in Snapchat. It seems to be partly broken right now as it shows a single achievement repetitively, but it’s appearing in the latest update for iPhone users. You can get to the trophy case by swiping on the small arrow at the top of the screen which shows your Snapcode. Are you seeing any different Snapchat trophies in your trophy case? Let us know in the comments! Update 12/8: Snapchat quietly removed the odd “trophy case” in another app update today. It’ll probably be back later, when it’s actually finished.